I don't usually write about travel contests. There are whole blogs about them, such as my friend Barbara's blog, Travel Sweeps. Not sure why this one caught my eye. Maybe because it came to my inbox, instead of appearing while I was cruising the Internet. Or maybe I need a vacation. Or perhaps it's because I haven't been to the Caribbean in a long while. Regardless, here it is. The contest for a chance to win seven nights at a beach resort in the Cayman Islands. For you and a partner. Uh oh. Can you say, "I'm a solo traveler?" The contest requires a 100-word essay about what would be a perfect day in the Cayman Islands. So here's my idea. Enter an essay (here's your chance to try travel writing! Of a sort...) on why your perfect day would be solo. Let's see if we can plant the idea that resorts should think of solo travelers when they price their rooms and promotions and such. Not just this one, but all of them. Yes, I know the business case for hotels and resorts preferring two people over one. But the contest asks you to describe the perfect day. And solo travelers can have perfect days just like paired up ones or families. Solo traveler finds friends in the Caribbean while kayaking and glass blowing. Nice! Ever been to the U.S. Virgin Islands? Wanted to go but didn't want to go alone because going alone is scary? Well, my friend Diane, another travel writer, passed along this testimonial from a 50-year-old male guest at Maho Bay Camps, an eco-resort on St. John. "I went to Maho Bay alone in November," he wrote. "I enjoyed my stay and found that meeting people, although not my forte, was not hard to do. Dinner time at the pavilion is a good place to sit next to someone and chat." So were the glass-making demonstrations and the kayaking lessons, he added. AND...Maho Bay Camps offers discounts on the room rates for solo travelers from now through December 14! Hallelujah. Instead of $80 a night, it's $60. They're actually "tent cottages" with private balconies and shared bathrooms and showers. Hence the low rate. And, once you're at a place like that, you don't walk away from the kayaking, never to see the person you met again. You run into them and then you're likely to smile and say hello, or hang out with them again somewhere. Especially if they came alone too. The resort offers an 80-degree aqua ocean, reefs and colorful fish for snorkelers and a white-sand beach. A 40-year-old woman who went alone described Maho as an "adult summer camp," with plenty of people around. Now THAT'S my kind of place! I'm not a beach bum in a lounge chair with a book in my hand, looking for a tan. I'm a doer! Especially if it's trying something I haven't done before. Like glass blowing. I liked some of the tips for solo travelers. Such as book short stays at hotels close to home. I could use one of those little spa holidays this minute. If only I weren't going to Mexico in three short weeks...oh wait. I'm thrilled to be going to Mexico in two weeks! Si, estoy muy alegre!! Any day now, the nice folks at my Spanish school in Guadalajara are going to email me with information about who my host family is for four nights. Now the trick is working double time at my job to get everything done in advance so I can actually enjoy my vacation. This is why being independently wealthy would come in so handy sometimes. Imagine walking up to a hotel registration desk and being told that you will get a discount because you're only one person in a double room. Ha! Yes, imagine it, because you won't often experience it. In researching a travel story on single supplements for the Kansas City Star, I learned about places that are a little kinder to the solo vacationer than others. One Caribbean resort built a whole wing of rooms for solo travelers, eliminating the single supplement. Many companies offer to pair you with a roommate to save you extra charges, if you don't mind sharing. Some companies try hard to keep the single supplement as low as possible, passing along only the extra costs hotels charge for single occupancy, but with no further mark-up. I'm not saying that single travelers are on par with couples and families when it comes to travel deals. They're not. Not even close. But it's interesting to see that some travel and tour companies are taking them into consideration. Is this the way of the future? Can we dare hope? I may be sooo 20th century, but sometimes I prefer to pick up a magazine instead of heading for the Internet for trip ideas. I'm looking, as we speak, at a section I ripped out of my National Geographic Adventure from November 2007. 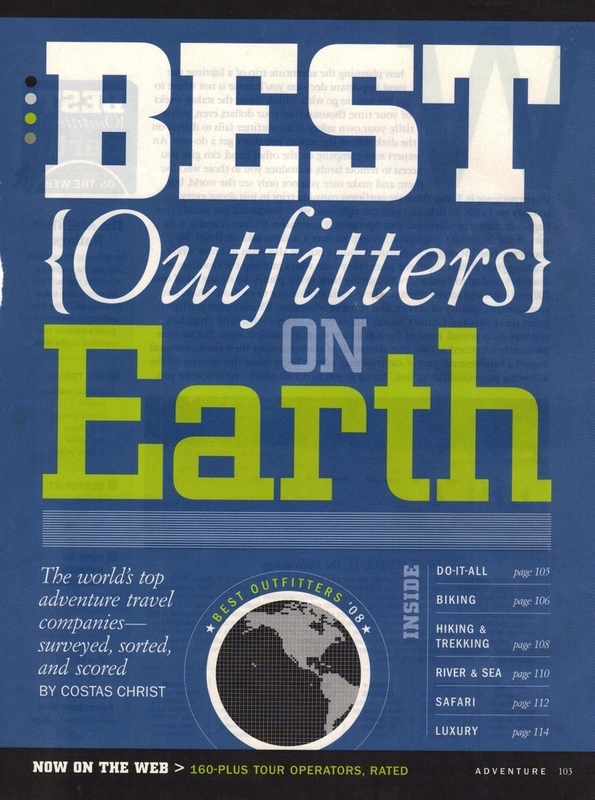 It's called Best Outfitters on Earth. When you don't exactly know where you want to go or what you want to do, a listing like this can be helpful. And inspiring. 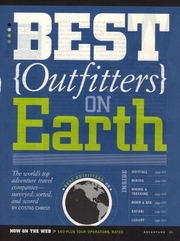 The section sorts outfitters into: Do-It-All, Biking, Hiking and Trekking, River and Sea, Safari and Luxury. Five to 10 companies are listed under each category, along with each one's "signature" trip and its price. If you know you want to go to Greece and bike with Aegea Adventures, you don't need listings like this. But if you're wondering what you should do for vacation, it helps to have a lot of random ideas and companies all in one place. 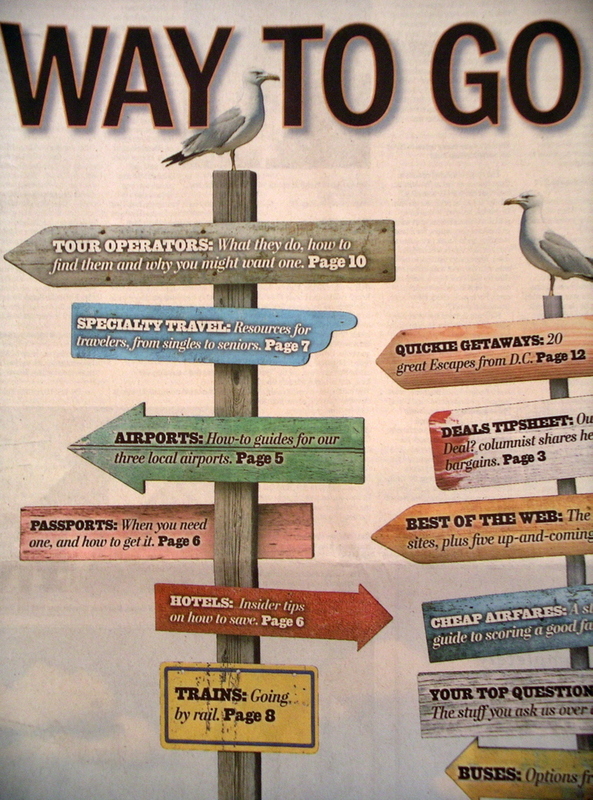 The Washington Post devoted an entire travel section to how to "travel wisely." It was directed at a Washington audience, naturally. But even if you're not from the local area, the info on "specialty" travel could be of great value. The "specialties" range from single/solo to volunteer to African American to gay and lesbian. Any of those categories could offer opportunities for solo travel. As could a section on traveling with pets. The paper provided info on organizations and travel agents and listed Web sites and phone numbers. The New York Daily News ran a story Saturday on the topic of solo travel. For the record, I don't much care for the term "solo-cation." But let the tour operators call it whatever they want as long as they're passing out deals. Several of the deals are pricey, but the article offered a nice variety of trips, from cruises to hiking to beach vacations. Just a few days ago, the Times of London also ran a story on "holidays for single travellers." Which in American English is "vacations for single travelers." Gotta love that British English. The paper provided a long list of travel companies. I'm thinking it could be fun to be the only American on a trip for a change. That's all for now. Cheerio until next time. Photo: Ellen Perlman. 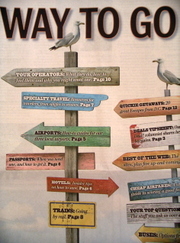 The Washington Post Travel Section front page.